The Nevada Lease Termination Letter | 30-Day Notice satisfies NRS 40.251 for terminating At-Will Tenancies provided the date the notice has been received is thirty days before the desired termination date. This is an important consideration that should be afforded in any At-Will Tenancy. Thirty days notice is required for landlords who send notice and thirty days for tenants who decide to cancel. Both parties benefit from this requirement in that a Tenant will need some time to find a new residence and a Landlord would need some time to seek a replacement. In both cases, this is a significant change in one’s income or lifestyle. As a general rule of thumb, the more notice given before the termination of such tenancies the less likely the remaining party would face disastrous consequences for losing the lease agreement. This is a positive way to end a landlord-tenant relationship which is generally favored. Step 1 – Place a check mark in the box situated next to the first paragraph. Step 4 – Go to the area below the dotted line. Then on the signature lines provided sign and print your name. Make sure to send this so that it is received within the time frame required by this state. Step 1 – Skip the first paragraph, then place a check mark in the box situated next to the second paragraph. Step 2 – In the first three blank spaces of the second paragraph enter the Calendar Date of the lease being cancelled (this will be listed on the lease itself). 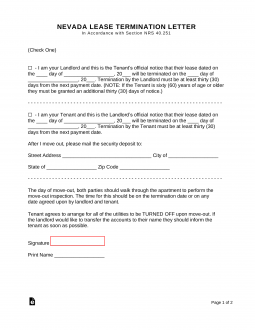 Step 3 – In the second set of blank spaces, enter the Calendar Date you wish to terminate this lease. Remember, this date must be thirty days after the Landlord receives this letter. Step 4 – Next, enter the Street Address, City, State, and Zip Code where the Landlord may send you your security deposit. You must make this information available to the landlord since they must return your security or provide you with an explanation for any withholdings. Step 5 – Below the two paragraphs under the dotted line, sign and print your name. Remember to double check your lease if there are any additional instructions for terminating this lease.